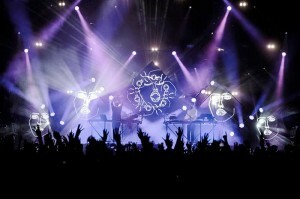 Liverpool based Adlib supported super-hot electronic duo Disclosure with plenty of enthusiasm, a control package for their latest UK tour and a sound system for their two sold-out Brixton Academy performances. The Brixton shows were the culmination of an amazing year for brothers Guy and Howard Lawrence whose career has leapt from 0-200 in the last 18 months. Disclosure’s production team including tour manager/production manager Toby Iddison and FOH engineer Rob Webster-Reed approached Adlib to put together a touring package after they had crossed paths on numerous festivals throughout the Summer … and all were impressed with Adlib’s attention to detail, dedication to the job and great sense of humour! The control package comprised two Midas PRO2 consoles – one for Rob and one for Barrie – complete with a Midas 251 stage box and an Adlib 48 channel splitter, plus a combination of L-Acoustics ARCs and SB28 side fills – all spec’d by Rob and Barrie. There were also two L-Acoustics SB28s onstage positioned behind Guy and Howard for air movement and they used Sennheiser 935 radio mics. Adlib supplied a pair of their MP3 wedges for the support DJs. For Brixton, a complete L-Acoustics V-DOSC system was installed, which was requested by Rob and specified by Adlib’s Dave Jones, based on his extensive knowledge of doing Dance Music shows there. Twenty V-DOSC cabinets were configured 10-a-side left and right hangs -. which is a tad more than they would normally use admits Dave, complete with three dV downs a side flown at the bottom of the hangs, plus two more dVs for centre stage lip fills. The sub-tastic elements were provided courtesy of six ground-stacked SB28s per side and the side fills were boosted to three ARCS and two SB28s per side - just to be sure there were no ‘volume’ issues. Adlib dispatched four additional Sennheiser 5200 radio mics and Sennheiser G3 IEMS for the assorted special guests lining up at Brixton, plus system tech Pete Seddon to look after it all! Rob comments that “taming the sub” to sound ‘musical’ was one of the most interesting challenges of the tour together with getting the ideal balance between acoustic and electronic percussion and ‘tickling’ the different systems to perfection each day! He really appreciated the EQ of the PRO2 which was an invaluable tool for daily tweaking of the master mix coming from stage, and of course added to all that, the guest vocalists kept everyone on their proverbial toes. Toby Iddison stated: “Adlib has been a breeze to work with on this project. With a busy schedule and us arriving back into the UK the day before starting the EU/UK leg of the tour, I needed to feel confident that we could walk in on a system that would fulfill our requirements with little or no rehearsal time. Meantime, everyone is predicting that 2014 will be even more of a major year for Disclosure!